Will I started my training with Navajo I am 4 weeks in. Prime has freight closer to my house. My mother is very sick I am wondering if I make the switch will Prime reduce my training from the 40k miles of tnt from a driver right out of school? I am 95% that I am going to Navajo Express for my first company. I talked to a former mechanic and former driver and both said good things but bad things. There were more good then bad to me. The driver said the only reason he left was mainly because they slowed the trucks down to 65. They paid him decent and gave him the miles. 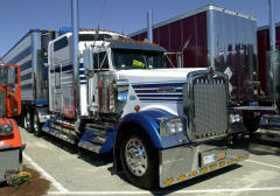 I want to join there company because they have some sweet trucks and I really want to drive coast to coast. I'm only 21 single and it's something I want. RUN RUN make money so I can buy a new dirt modified =)! It was tuff to choice them over prime. Yes prime pays very good out of school but I don't want to live in a closet (light weight trucks) and they are a mega company if I understand it right. Navajo is big but not as big. I think. You misunderstood, it's 30,000 miles team driving and 10,000 during the PSD phase where you are the primary driver and your instructor is watching you in the passenger seat. Mike, the starting pay for a fullsize truck is .38cpm, and for a LW truck it's .43cpm. The time will go by fast. Every student, especially the younger guys like me and you, would greatly benefit from a longer training period. I'm a retired Instructor/Trainer at Prime. If you have any questions feel free to ask. Thanks! In the the prime orientation info they sent me that said I would right to TNT and I would be a C seat which says I would have to obtain 40000 miles team driving. But I hope it goes like you said. I'm sure your right cause you worked there! Thanks Again. I go to National Tractor Trailer School in Liverpool, New York. I graduate on April 6th. And I am very undecided on where I want to work. Home time is not a big deal to me. But I want the option to be home a few weekends here and there. I'm 21 and have friends and a good life. I want to travel all 48 states also. I have pre hires from Prime, Tran Am and Swift. I am interested in Prime but they want me to do 40,000 miles team driving but not sure how to feel about that for training. How can someone train me if there sleeping when i'm driving and the way around?